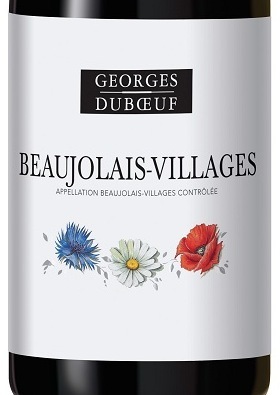 Summer time is the perfect time to break out the Beaujolais and put a nice chill on it. It's fruity, refreshing, and even holds enough complexity to help you stay interested. Beaujolais-Village of course takes it's name from a number of wine making villages (38 to be exact) in the Beaujolais production area. Georges Duboeuf is very well known to those familiar with these fruit wines made from the Gamay Noir grape. In fact, many of you probably have seen his "nouveau" bottling every November with the flashy and flowery labels. When I first poured this wine I immediately was impressed by the deep purple and almost punch-like color. The bouquet is packed full of fresh raspberry and candy-like aromas. There is also a hint of soil or a rustic metal aroma that keeps the wine from appearing too much like a popsickle.